Much like Martin Luther King Jr., you can feel the influence of renowned artist Jean-Michel Basquiat all throughout Atlanta. It's there, on the giant Hebru Brantley-helmed mural on Edgewood, it's at Krog Street Tunnel, and in the urban galleries and tattoo shops that have come to define the city's progressive, civic-minded arts scene. Basquiat's untimely death, frantic work ethic, and ability to simply translate the sociopolitical concerns of the streets into fine art have led to his mythologization. The so-called "patron saint" is referenced by people who don't even know what his work looks like, but aim for credence in pop culture spaces. The "crown prince" and his influence on Atlanta, in some ways, intersects with King's. Atlanta, at its core, is hip-hop meets civil rights. Had the activist lived to see the artist's emergence, King might've owned a Basquiat. Basquiat: The Unknown Notebooks will be on view at the High Museum through May 29. To understand Basquiat's direct influence, we solicited words from 10 Atlanta-based artists whose work can be seen throughout the city in diverse spaces. They, like Atlanta, all have a Basquiat story. 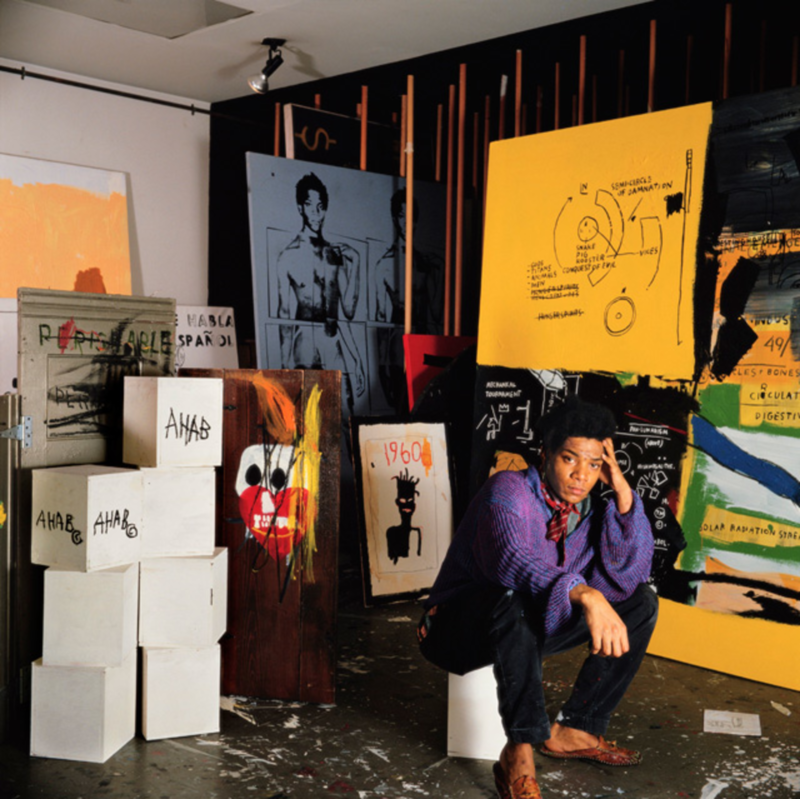 "You don't look at a Basquiat work — you read it." "No pun intended, but it's actually 'words,' the linguistic aspect of Basquiat, that speaks to me the most. Much of my work, like Basquiat's, is centered around or extended from words — both spoken and written. I consider Basquiat a hip-hop artist though he's claimed and recognized more broadly as a fine artist (that distinction would need a completely separate article). In fact, you don't look at a Basquiat work — you read it. Line, texture, form, tone, sound, color — these are the contexts for really, deeply investigating his works." "I often feel that the comparisons to a 'childlike quality' or some type of 'primitivism' in his work betray the sophistication of his thoughts and ideas." "In 2014, I edited Art Papers magazine on the theme of intersections between hip-hop and fine art. Shantrelle Lewis, an independent curator out of Philadelphia, wrote an essay comparing JMB to the Yoruba deity Eshu — Eshu being the trickster and perpetual child, the wise and astute gatekeeper, the enigmatic and cunning communicator. Her piece gave me a new and different context through which to think about Basquiat and I have been flirting with doing a broader examination of his work in this vein. Currently, the High Museum is showing a piece called "Potato Study" which features three floating heads, which are read as potatoes. But elements in the work, the number 3, and the shape of the heads is also quite reminiscent of laterite or concrete heads used throughout the Ifa world as figurations of Eshu. I think that elements of African retentions, especially those he may have experienced through his Haitian heritage are often overlooked. I often feel that the comparisons to a 'childlike quality' or some type of 'primitivism' in his work betray the sophistication of his thoughts and ideas." "It's pretty rare that even some 40 years after his death, he continues to deliver fresh ideas and ways to think about art." "I think one of the best aspects is that we are still talking about him, still being introduced to his work and ideas and still being challenged by them. It's pretty rare that even some 40 years after his death, he continues to deliver fresh ideas and ways to think about art. I can only hope that my own work will have the same impact!" "I see layers of urgency and spontaneity but also moments of calm and restraint in the larger spaces of color." "Basquiat uses line and color as a lyricist uses words. His paintings are freestyle in visual form, automatic and flowing. The timeless songs have great replay value, which is why I seem to find something new in his paintings even if I've seen them several times. In his painting "Scull" the vibrancy of color is what speaks to me first, then a lively crescendo of mark making and lastly the words. I see layers of urgency and spontaneity but also moments of calm and restraint in the larger spaces of color. "Basquiat's work reminds me to be a prolifically active observer of life." "Basquiat channeled an urban energy — a sprawling vibrancy of cultures, experiences, and spaces in which he was fully immersed. Self-referential at times, he created work that documented his community and the community, in turn, was enriched by his work. As an artist, Basquiat's work reminds me to be a prolifically active observer of life — and to leave a lot of documentation around for the next generation of creatives." "Basquiat's work was like a new sound of music that I couldn't explain but excited me." "Basquiat's work changed my life at a very early age. I visited the High Museum frequently with my mother as a child and upon discovering his work I assumed art was built on classical technique instead of elements and principles. Basquiat's work was like a new sound of music that I couldn't explain but excited me. Most of my friends are just into the vivid colors of his work but I've always been into the lines and space usage. [I was also into the idea that] the content was his view on life and the times. Him being into jazz music and also being a musician showed in his work, which inspired me to do the same with hip-hop. The most important piece to me of his is "Head of a Fryer," which is a three-dimensional piece. This piece is important because I can tell it was for him and not just for a gallery showing. I think he used art to entertain himself and that is exactly what I strive for now." "A person uneducated in fine art might just see his work as 'primal.'" "The public definitely looks over the fact that he had so much pride in his work. A person uneducated in fine art might just see his work as 'primal' or being 'thrown together' but if you study his work as a whole, and then piece by piece, you can feel his emotions just through the line. Some of his work has a harsh tone, while some of it has a soft or minimal feel. The piece "Philistines" may be confused as being primal or childlike but if you look closer, it embodies every element of art, which makes it sound." "He's always held a huge influence on my career as an artist — I even have his portrait tattooed on my right hand." "I've always been a huge fan of Basquiat. He was the only majorly successful African-American visual artist I heard of while growing up, so he's always held a huge influence on my career as an artist — I even have his portrait tattooed on my right hand. Recently, I created a series of paintings called SAMO, inspired by the work of Basquiat, where I re-worked some of his old paintings into a series of African masks in my own style. But since I was reproducing some of his previous work, I felt like 'SAMO' or 'same ole' would be an appropriate title. It's not uncommon for artists to draw inspiration from other pieces in art history, drawing influence from the masterpieces of the past. This is something Basquiat played with himself. His work speaks to me because he was so confident and carefree during his creative process. Although some of it might appear to be 'childlike' or 'primitive' every mark he made was very deliberate." "For all the partying and drugs and late nights, he always made time for his work. And to me that's what truly separates those who want it and those who are 'trying.'" "I have to say, as much as I am a fan of his art, I was more a fan of his work ethic. When I used to live in my old apartment, at one point I didn't have cable or Internet for a bit and I would play the Julian Schnabel-directed movie of Basquiat on repeat as motivation — definitely at least once a day [laughing]. Basquiat died with thousands of drawings and hundreds of paintings. He had an extensive collection of work that would surpass a lot of living artists' careers. I always found that to be interesting. Because, for all the partying and drugs and late nights, he always made time for his work. And to me that's what truly separates those who want it and those who are 'trying.' He made time for what he loved. He was making art when he was dead broke, and making art when he made money. His jazz pieces always stood out to me, and when I studied art history in college, his 'Max Roach' piece with Dizzy Gillespie was definitely one that I was attracted to. I loved that his work wasn't confined to the ideas of what 'high brow' museum pieces were supposed to be at the time." "The work for me speaks to not only an attitude but a specific vision and voice of the time period, like the records of early hip-hop." "The work for me speaks to not only an attitude but a specific vision and voice of the time period, like the records of early hip-hop. That vision and voice have still remained fresh in today's art making. The work, although steeped in African, Creole, and street aesthetics, smashed with art history and sampled with jazz like early hip-hop records. The work has a deep patina and aesthetic quality as if it were ripped from the walls of an urban environment. The evidence of vandalism and cover-ups as mark making fall directly in line with abstract expressionism and neo-expressionism. The pushing of paint and testing the limits of materials answers what art can be, or is, from the voice grit like hip-hop." "At the end of the exhibition, I turned the corner and there it was. I kinda just froze up. It vibrated and shook the wall." "'Untitled (Cadmium)' (1984) is special because it was the very first Basquait work that I was able to see in person. When I was younger, my mother brought me to Atlanta to see Matisse. I am a fan of the flatness. At the end of the exhibition, I turned the corner and there it was. I kinda just froze up. It vibrated and shook the wall. I was already painting very loose because I was a fan of Rauschenberg and DeKooning. I had known of Basquait from my books, and this simple piece stole the Matisse experience away from me." "He was the first to turn street culture into high art." "There are so many different qualities about the work we could speak about. Whether it's the aesthetic qualities, or subject matter. I truly like the fact that he inserted himself into the canon of western art with a street language by remixing text and imagery. He was the first to turn street culture into high art. If you think about it, it's what's still happening today with what they call 'street art.'" "He is our patron saint." "I think most artists that care about abstractions and mark making have in some ways remixed his marks and scrawled text on an image as a painterly mark or graphic element. He is our patron saint." "His work ethic inspired me tough." "His work ethic when he created his pieces inspired me tough. He was constantly creating. And his expression of his artwork, from tagging on walls with some of his abstract creation with live colors, screamed of complex graffiti pieces mixed with tags in hip-hop. That 'Fallen Angel' piece, I feel a connection to. I know as artists, we're constantly trying to raise the bar with our creation. Too many highs and lows. Plenty of highs, but some days I feel like I'm crashing toward earth after a rough patch. That's why I'm feeling the 'Fallen Angel' piece." "Even though he was inspired by other artists, the pieces still had his original touch. Honestly, the messages through the artwork [speak to me] and showing black people with abstract crowns over their heads to show we're way more than how the public sees us." "The best aspect of Basquiat's work is his freedom. He was a graffiti artist. A drummer. Painter. Whatever he wanted." "The best aspect of Basquiat's work is his freedom. He was a graffiti artist. A drummer. Painter. Whatever he wanted. I like to think I follow my own path as he did. I paint. I sing. I act. Whatever the idea calls for." "You could say he gave me the freedom to do what I wanted." "I didn't study Basquiat at all. I actually spent years hating Basquiat's work. Coming from a controlled approach to all things art, as someone who prefers technical skill, he didn't appeal much to me at all. But after doing my research, and hanging with a few colleagues, I realized the significance of his work in the pop era. I felt the freedom to apply poetic license to what I am doing. You could say he gave me the freedom to do what I wanted. Illustration in college, in a way, confined me. As an illustrator, we were taught to be a translator for someone else's vision or idea. I saw everything he did from his childlike approach to his pieces as freedom. Being a technical artist can be like jail. You put this pressure on yourself to be accurate." "He was the voice for the outcasts." "Basquiat was part of that young Manhattan, late-'70s, early '80s creative movement that so much talent came out of. That was around the time I was born, also around the time when hip-hop was being introduced to the rest of the world for the first time. I've always felt like Basquiat's work was one of the best reflections of that time period, not only with the bright colors and wildness of his technique, but because he was the voice for the outcasts. I think his art inspires the same as hip-hop music inspires a generation that otherwise may not believe you can break out of this twisted social/economic structure we live under. Me, being a minority born in New York, his work is extremely inspiring to me." "His art always seemed to be more emotionally driven, more about purpose than technique." "If I had to pick one aspect of Basquiat's work that most influences me, I guess it would be the freedom in his drawings. He never tried to draw 'correct.' His art always seemed to be more emotionally driven, more about purpose than technique. Looking at his work is like getting to see his visual thoughts, without reality's restrictions. That's the freedom I search for with my art. "By far the most important lesson I've learned from his life experience is not to go so hard with the drugs." "The fact that is seems as if he truly doesn't care about the viewer or consumer must have given him a sense of feeling free when he was working." "What moves me about Basquiat's work is the IDGAF energy it has. When I look at it, I can tell that there are conscious decisions being made as it relates to composition, color, scale, etc. But the fact that it seems as if he truly doesn't care about the viewer or consumer must have given him a sense of feeling free when he was working. I strive for that feeling in my work."